I copied it into this page only because I wanted to make a few comments about natural gourds in relation to the subject of housing standards. Since the PMCA has already established a sheet with some standards for houses, I'm using it as a base to increase the comments to natural gourds as well and because I'm a gourd man, as are a lot of other people in the country, I'd like to make some additions that apply to gourds where applicable. Those comments will be identified by "Gourd Comment:". I'd like it known that I agree whole heartedly with the drive to change martin housing standards so that life is made a whole lot easier and safer, not only for us landlords, but for the birds, as well. There are many sub-standard houses on the market today and with all the research that's been done on martins in the last couple of decades, it's time that we as landlords utilize these findings and see to it that they are applied to martin sites when and where ever possible and that sub-standard housing be done away with and replaced with good, quality housing. The breeding biology and management requirements of the Purple Martin dictate the features of the housing. Since a Purple Martin house must be placed in an open area, in full sun most of the day, adequate ventilation, protection from rain, and a white exterior (for coolness), are important features for successful nesting. A martin house can be any size from 4 or 6 compartments on up. Compartment size: Minimum size for each compartment is 6" x 6" x 6"; larger is better. A compartment that is 7" (wide) x 12" (front to back) offers greater protection from predators and the elements. An adult martin is approximately 7&1/2" long, and as the clutch size averages from 4 to 6 young, there must be room for six to eight birds in a single compartment, since parents sleep with their young at night. With larger compartments, European Starlings can become a serious problem, but a new design idea is being used to keep starlings out of martin housing; see next item. Gourd Comment: Natural gourds are also a favorite with martins and like housing compartments, gourds should also be nice and roomy. 9" in diameter should be a minimum for gourds with 10" being even better. Martins are known to lay larger clutches with the larger housing compartments and likewise with the gourds. A lot of room is needed with a clutch of 7 young and a good 10" gourd has a full 78.5 square inches available. These larger diameter gourds also allow the martins to back out of the way of any predators' reach should they happen by. 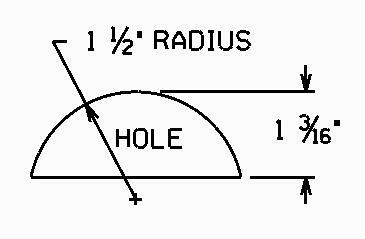 Entrance hole: The range of acceptable sizes for round entrance holes is 1&3/4" to 2&1/4"; 2&1/8" is frequently used. Size of 2&1/2" is also usable, but not recommended. It is overlarge, and admits predators (some species of small hawks and owls) more readily, and also admits more rain, and cold air. Distance from bottom of entrance hole to floor of compartment: 1" to 1&1/2". Housing should also come with door plugs to close compartment holes during the off season, and in early spring. This is essential for keeping House Sparrows and European Starlings from taking over martin housing. For houses that have the larger compartments, a starling-resistant entrance hole is strongly recommended. These new holes (SREH's) have been tested since the early 1990's and are proving to be an asset in allowing martins a safe nesting place that is not accessible to starlings. See sheet titled SREH for details. Gourd Comment: The use of Crescent SREH's in gourds is also strongly urged, especially in the large natural gourds. Starlings love them too and once they claim one for themselves, will fight to the death for it. Whether it's an established site or one just starting out, these holes have proven to be effective in repelling the European Starling from getting a foothold in a martin site. The following is a diagram of the dimensional requirements for a Crescent SREH. As for location on the gourd, the bottom line of the hole should be on the equator of the gourd, keeping the 1 3/16 as accurate as possible. Height and placement of housing: A height of 12 to 20 feet is recommended; no higher unless necessary, due to nearby trees or other obstacles in the flyway. The higher housing is placed, the more susceptible it is to wind and storm damage. Most commercial pole systems are 12' to 15' high, after installation. Poles need to be set in concrete, so 18 - 24" of the pole will be underground. Some manufacturers offer a mounting socket, so if the owner wishes to relocate the housing, he needs only to remove the pole from the socket. Martins require a wide open area around their housing, and martin housing should always be placed within 100 feet of people (a house, or other active area), and at least 40 feet from trees, farther if possible. In the southern half of their breeding range, martins will sometimes nest within 15-25 feet of trees. Vertical accessibility: Any house or gourd system should lower and raise vertically, which makes a telescoping pole, lanyard system, or winch system an important feature. This is necessary for two reasons: to allow for regular, sometimes daily, removal of House Sparrow and European Starling nests; and, to allow for safe and easy monitoring of nesting martins. House Sparrows and European Starlings, two nonnative birds, are major factors in the decline of Purple Martins. If they are allowed to nest in martin housing, martins will not stay. House Sparrows and starlings will chase off and fight with martins, break their eggs, and even kill nestling and adult martins. Regular monitoring is also an important part of successful martin management, allowing landlords to keep track of how many young are in each nest, etc. If a nestling is found on the ground, a system with vertical access allows it to be quickly returned to the house, and to the correct nest compartment. Landlords who do not monitor their site will not know if predators such as rat snakes, raccoons, or owls have raided the site at night. Such raids usually result in permanent abandonment of the colony site. If a landlord is alerted to the situation through monitoring, he/she will be able to take steps to protect the colony site, by adding a predator guard to the pole, and owl guards to the house. Orientation marks, for raising the house to the correct orientation after nest checks, and a locking mechanism, to keep the house from spinning or twisting in the wind, are important. If landlords do not reorient compartments to face the same compass directions after each nest check, the martins will become disoriented, and abandon their nests. A locking mechanism on the lower portion of the pole will prevent accidents or vandalism. A tilt-down housing system, on a hinged pole, is not recommended, as it cannot be accessed once the martins begin nesting. Tilt-down systems do not permit landlords to remove sparrow and starling nests, or monitor martin nests, and thus are not functional, and should be avoided. Gourd Comment: There are a number of different rack designs available for use to hold gourds and it is agreed that the vertical accessibility is a must. Any 'good' designs today are vertical access in nature and this applies to any gourd setups. The persistence of Sparrows and Starlings will require daily access and vertical raising and lowering of the gourd rack is a must and as stated, non-functional designs should be avoided. Porches: Porches are not a requirement, but if porches are included, they should be equipped with dividers, or separated so nestlings cannot walk to other compartments. Porch width should be at least 4". Railings on porches are optional. If railings are used, the gap between railing and porch floor should be 5/8", or less. Railings that have gaps any wider than this can trap nestlings and adult birds. Gourd Comment: Gourds do not require porches, outside or inside. Outside porches only make it easier for starlings and sparrows to usurp a cavity. As for inside, simply supply enough material to bring the nest level up to the bottom of the entrance hole. Perches: Martins will use additional perches placed above or below the house. Perches at each entrance hole are not desirable, and will only encourage House Sparrows and starlings. Gourd Comment: Likewise, perches at the entrance holes of gourds are not required and, as stated, will only attract pest birds. Wooden houses: Only untreated wood (no pressure-treated wood, no chemically-treated wood, etc.) should be used for bird houses; pressure-treated wood is recommended for mounting posts, if wooden posts are used. The exterior should be painted white, or come with instructions to paint the house white. Interior of compartments should be unpainted. Stock of 3/4" thickness is best, as it offers better insulation against heat and cold. Due to weight, wooden houses are best mounted with a winch for raising and lowering. Smaller wooden houses, 6 or 8 compartments, 25 lbs. or less, may be mounted on a telescoping pole. Cypress or cedar are best choices for longevity; pine or redwood would also work. Exterior plywood will not last as long as solid stock. Gourd Comment: Natural gourds will last much longer if treated with Copper Sulfate. A 20 minute dunking in this mixture (1 lb Copper Sulfate to 5 gal water), will make a natural gourd last up to 20 years or even longer if properly cared for. And remember, the thicker the wall, the better for insulation. Plastic houses: The exterior color should be white or a very light color. It is very important that the walls and roof are opaque, admitting no sunlight. Translucent plastic will overheat quickly in the sun, killing nestling martins. Ultraviolet inhibitors will extend the life of the housing, which will be out in the elements and sun. A layer of insulation added to the attic, or above the upper tier of compartments, is desirable. Gourd Comment: With the introduction of the new plastic gourds to the market, these rules also apply to them. Many plastic gourds that are mass produced today are not properly designed nor fit for the safe rearing of martins. Many are much too small, have too large an entrance hole and are not accessible to remove pest bird nests. If plastic gourds do not have the large diameter size, SREH's and easy accessibility into them, then they should not be used. Metal housing: A white exterior is preferable; roof can be white also, but this is not a strict requirement. A layer of insulation added to the attic, or above the upper tier of compartments, is very desirable. Heat waves, and cold spring weather, can contribute to mortality of nesting martins. Overheated nestlings will jump out of their housing, and die on the ground. Spring weather can include late snow storms, when no food is available for martins. An insulated house gives them a better chance of surviving without food for two or three days, until weather warms up, and flying insects are available again. Gourd Comment: Likewise, natural gourds should be painted white. Unpainted gourds will get just as hot as an unpainted house and the young will perish from over heating. Floor texture: Flooring in both metal and plastic houses is too slippery to allow nestlings to keep their footing (similar to a dog on linoleum), and a sub-floor of textured material should be provided. Nestlings on slippery flooring sometimes develop abnormally, with permanently splayed legs, and this fatal abnormality is easily prevented by providing a textured floor. Wooden floors do not cause this problem. Some commercial housing offers textured metal sub-floors, or slide-out wooden nest trays. Both prevent the problem, and make end-of-season nest cleaning easier. It's also important that sub-floor material drain well, and not retain moisture. Materials such as outdoor carpeting are not suitable. Gourd Comment: One good thing about natural gourds, they need no extra work done on their floors. Their natural interiors are easy for the matins to walk on without any difficulty. However, they do need 4 or 5, 1/4" diameter drainage holes drilled around the bottom to allow any water that may get into them to escape. Compartment access: Hinges or other mechanisms to open compartments easily, without destroying the nest, or causing eggs or young to fall out, are very important. Access to individual compartments during the nesting season allows for easy removal of House Sparrow and European Starling nests. Compartment access also facilitates regular monitoring, and cleaning at season's end. Some designs now feature removable nest trays that allow for easier monitoring and cleaning. Gourd Comment: Natural gourds can be fitted with a 4" plastic jug top (available from the PMCA) that allows easy access into the gourds for whatever reason. Whether it be adding nesting material, cleaning out pest bird nests or simply doing a nest check, these access ports are a new and necessary device that the landlord will cherish. Predation: A pole predator guard should be part of the system, or information on how to add a pole predator guard should be included. Any type and size of pole, wood or metal, is easily climbed by several predators of Purple Martins, including raccoons, rat snakes, and squirrels. Wood posts or poles can also be climbed by domestic cats and bobcats. Aerial predators, such as hawks, crows, and owls, will also raid martin housing. Conventional 6" x 6" x 6" compartments offer no protection; owls can easily reach to the back of the compartment. Crows and hawks will often take nestlings that are waiting at entrance holes. The solutions are either an external barrier guard, like a bird cage, fastened against porches, or, deeper compartments, with offset entrances, and internal baffles. Common features to incorporate in all types of housing: Since martin houses are placed in the open, fully exposed to wind, rain, and summer sun, good ventilation, drainage, and insulation are important to the well-being of the martins. Materials and construction methods should be chosen for their ability to withstand windstorms and hailstorms. The roof overhang can be extended to help protect upper compartments from rain. Ventilation holes should be under the roof overhang, so rain won't enter through ventilation holes. Drain holes in the floor of each compartment will allow blowing rains to drain quickly. Several holes in the floor of each compartment are required. Raised sub-floors, or larger compartments, also offer protection from rain. When larger compartments are available, martins choose them over smaller compartments, and place their nests as far from the entrance as possible. This protects them from predators and rain. Martin nestlings do not become feathered until they are 10 days old; they are susceptible to hypothermia, and will quickly become chilled in a rain-soaked nest. Extreme heat can also be deadly to nestlings, and adjustable ventilation louvers added to the exterior of housing are used by some manufacturers. These allow extra air to cool the house during hot weather, and can be closed during cool weather. A martin house should be easy to maintain, and durable. Since most people leave the poles up year round (some also leave houses up, plugged shut), any treatments to reduce weathering and rusting on the pole will prolong the life of the system. Some manufacturers of martin housing also offer accessory items, such as bait-traps for House Sparrows and starlings, and a trap-door, sized to catch House Sparrows, that fits onto the martin house. Extra perches and owl guards that fasten to the exterior of the house are also popular items. Gourd Comment: Traps can also be used in natural gourds as well if the proper access door is added. Again, just about all the features that a house utilizes can be installed in a natural gourd. Just as much can be done with a rack of gourds as can be done with a house. Literature required: If manufacturers include the following information with the housing, it will greatly benefit potential landlords: the breeding range of Purple Martins in North America; how to place housing appropriately; how to determine if a yard is appropriate habitat for martins; when to open up housing in spring; and, the importance of keeping other species out. (Nonnative species through nest removal, trapping, shooting, or use of starling-proof entrance hole. Native species, such as bluebirds, Tree Swallows, wrens, flycatchers, are all federally protected; they may not be trapped, etc. The key to management of native species is timing and monitoring; erect suitable boxes for native species, and keep the martin housing closed until competing birds are nesting in single boxes erected for their use. Stokes Purple Martin Book, Donald and Lillian Stokes and Justin Brown; 1997. Little, Brown and Co. Enjoying Purple Martins More, by Richard A. Wolinski; 1994 by Bird Watcher's Digest Press. Homes for Birds; 1991. Department of the Interior, U. S. Fish and Wildlife Service. How to Attract Purple Martins, by James R. Hill, III; 1988. Purple Martin Update. If you send me an Email and ask a question and do not get an answer of some sort from me within a week, it's because your return email is not correct. Find out what your correct email is, correct the problem and then send your question to me again. It make take me a day or two to answer, but I answer all emails containing questions.